Green Bell peppers are commonly known as sweet peppers or capsicum (Capsicum Annum). These peppers have a bell shape, thick and brittle skin with glossy outer cover and a fleshy texture. Green Bell Peppers are a type of pepper that have a mild pungent to sweet flavor unlike the other varieties of pepper. This is because “capsaicin” a substance which controls hotness in peppers is present in very small amounts in it. However, green peppers not only taste good, but have a large number of benefits too. Green pepper are loaded with powerful antioxidants. They are rich in vitamin A, B Complex (especially vitamin B6 and B9), and C, which are known to fight the effects of free radicals in our body and maintain our overall health. Green Bell Peppers are known for their anti-inflammatory properties which help in relieving the pain and swelling caused by diseases like osteoarthritis, rheumatoid arthritis, etc. Having Green Bell Peppers in your diet is known to be very beneficial for people suffering from Asthma. These bell peppers are loaded with phytonutrients which help in relaxing the respiratory passage and reducing panting. Phytonutrients found in Green bell peppers work to promote better overall health. Bell peppers contains lycopene which is an important compound that is excellent for a healthy heart. Green capsicum is also loaded with cholesterol lowering fiber which prevents the risk of heart disease. They are also a good source of vitamin B6, folate, and Potassium too which help in controlling the homocysteine levels which is known to lead to a higher risk of heart diseases. Antioxidants like vitamins A and C present in Green Bell Peppers fight against free radicals. The presence of potassium in it also helps in lowering the blood pressure. Green Bell Peppers contain Vitamin B6 and vitamin B9 which help in lowering the level of homocysteine in our body. Homocysteine is a noxious by-product of various internal biochemical procedures, which can adversely affect your health. Fiber is a compound which helps with healthy digestion and also works to maintain the cholesterol levels in the body. Just half a cup of red bell pepper provides the body with about 1 gram of fiber. Eating food that is rich in fiber helps to protect the body against colon cancer and also treats digestive disorders like constipation and irritable bowel syndrome. We know that green peppers are a rich source of vitamin B6, which is one of the most vital nutrients for our body. This vitamin helps in boosting our immunity to keeping our nervous system up, it can regulate a number of bodily functions effectively. Green Capsicum are loaded with calcium, and help to keep our bones and teeth strong and healthy. It helps in maintaining our overall oral health. Green Bell peppers are loaded with vitamin C which is essential for the production of collagen. Collagen is a compound which is needed for having a healthy skin as it works to protect the cells from oxidative damage. Drinking green pepper juice on a daily basis is known to fight all signs of ageing and works in keeping your skin healthy. 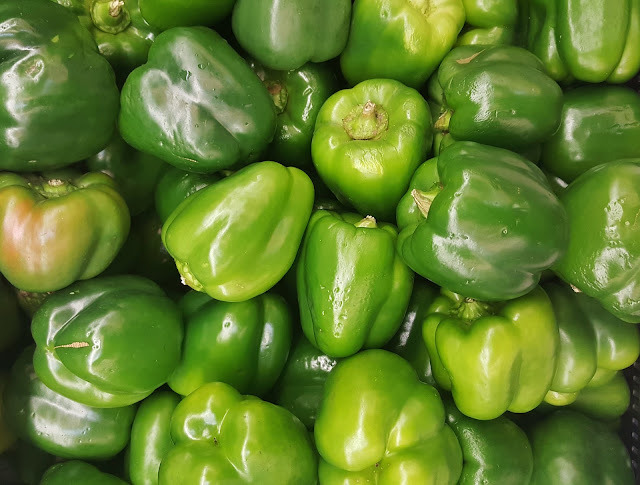 Green bell peppers are loaded with phytonutrients which are known to be very effective in curing rashes, blemishes, acne, and other skin infections. Certain infections like athlete’s foot, herpes zoster, etc. can be treated with green peppers due to its anti-bacterial and anti-fungal properties. Green Bell Peppers are rich in vitamin C. Vitamin C is needed for hair health and further, helps in effective absorption of iron in red blood cells to carry oxygen to hair follicles. Vitamin C is also vital in the production of collagen which is needed by hair follicles for optimal hair growth. The deficiency of Vitamin C can cause serious hair problems like dry & split hair. Green Bell peppers work to improve the blood flow in the body and also the scalp which is needed for proper growth of hair and protection of hair follicles from the effects of dihydro testosterone (DHT). Application of a fresh paste of green bell pepper on hair is highly effective in boosting the hair growth as it leads to improvement of blood circulation in the scalp. Take a few dry green bell peppers and boil them in water for 5 to 6 minutes. Now let them cool down, Now massage these boiled bell pepper on your scalp using a cotton pad and let it sit there for 10 to 15 minutes. Then wash off the hair. You can apply it twice a week to get best results.